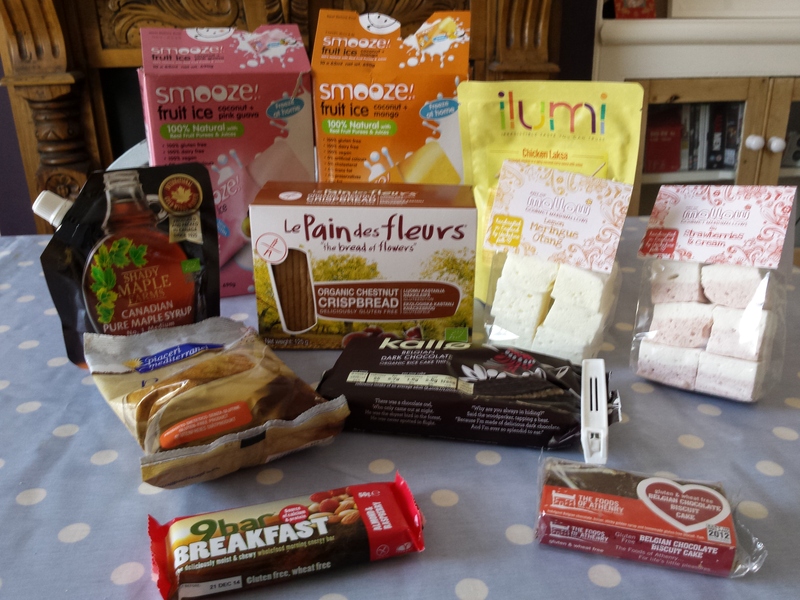 A few months back I was offered the chance to sample a range of gluten free products from a new on-line retailer called FreeGo. Their shop boasts a variety of GF sweet and savoury products, many of which were new names to me. It is always good when a retailer can broaden your gluten free horizon and introduce you to something new. 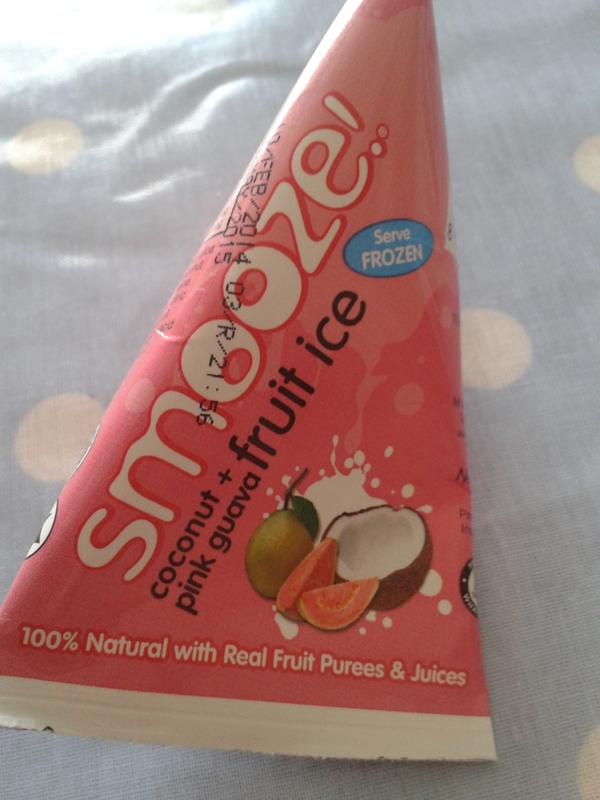 Amongst the items I received were some fantastic flavoured marshmallows, an amazing Belgian chocolate orange biscuit bar and some lovely Smooze fruit ice which you freeze yourself at home. The Smooze products are simply made from coconut milk and fruit juice so not only are they made with 100% natural ingredients they are also dairy free. The lovely guys and girls at Freego, whom some of you may have met at this years Allergy Show, asked me if there were any other products that I would like to see stocked. One area that I thought was lacking was gluten free beer and lager. FreeGo took this advice on board and contacted me a few weeks back to say that they had chosen Green’s Belgian craft beers as their first gluten free beer to stock. 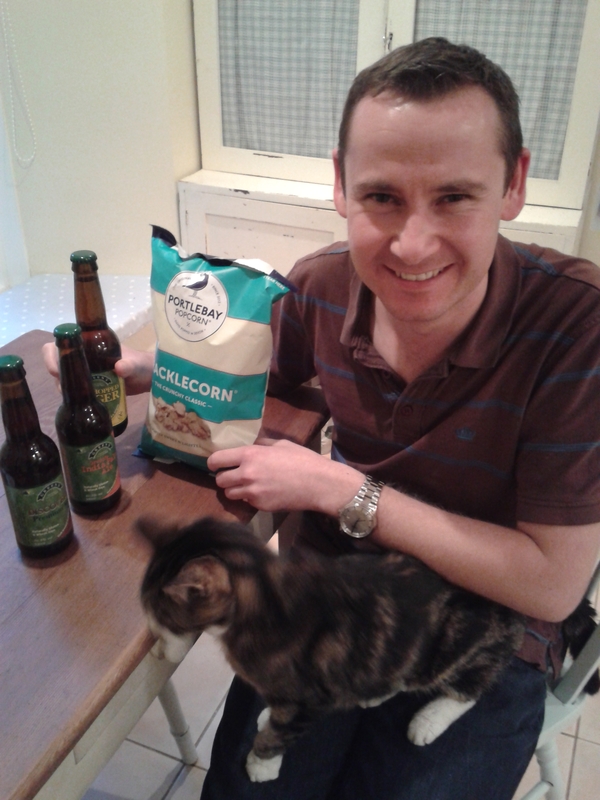 FreeGo have chosen to stock Green’s naturally gluten free beer, rather than a de-glutenised product. I was lucky enough to be offered some samples to try out, and I managed to have my arm twisted to try some free gluten free ale 😉 Readers may be familiar with Green’s if you’ve tried their gluten free pilsner which is available at Pizza Express. Az keen to help with the beer sampling! Pre-coeliac I was always a lager drinker rather than being in to ale, so this was naturally the first sample I went for. I’d actually tried a small sample of this one at the Allergy Show and had been impressed. This lager was a gluten free gold medal winner at the 2014 World Beer Cup so is claimed to be “officially the best gluten free beer in the world!”. Naturally gluten free ingredients include water, sorghum, millet, buckwheat, brown rice and yeast, and brewed to a strength of 4%. This lager is extremely fruity and refreshing, and would be perfect for drinking on a summers day. If I remember rightly from the allergy show the “fruitiness” is in fact elderflower. I sampled with a few colleagues from the Coeliac UK Plymouth group. A few were unsure about the elderflower, and many felt it didn’t really taste like lager – though not necessarily in a bad way. Personally I thought it was as good as I remembered from the Allergy Show, certainly different from a traditional lager but really enjoyable. Made with similar naturally gluten free ingredients to the dry hopped lager, this ale is brewed to a rather cheeky 6%. I’ve never really been an ale drinker but maybe my taste buds are maturing and I really enjoyed this one. In fact this was generally the favourite amongst the tasters of the Coeliac UK Plymouth group committee, even being described as “bloody lovely” by an ale drinker amongst the group. There was no fruitiness to this one and the taste testers generally agreed this tasted like a “proper” beer. The experience of trying this would certainly lead me to trying more ales in the future. The IPA was brewed to 5%, splitting the difference between the lager and the ale, but again made with similar ingredients. I enjoyed it but I think the general feeling was this was perhaps the least favourite of the three amongst the group. Again a bit of a fruit/floral taste to this one so almost a middle of the road between the two beers above. This ale does have strong credentials though having been voted the best gluten free beer at the 2014 Free From Food Awards. Overall I really enjoyed the three beers. Since being diagnosed with coeliac disease I’ve very much become a cider drinker. I don’t really miss lager, but when I get my hands on some now it always feels like a special treat. I’d happily drink any of these beers again, and let’s hope in the future we might even see gluten free bottled beers in pubs. Maybe we need to encourage one of the big chains like JD Weatherspoon to start stocking a gluten free beer and then others might follow. As you might notice in the picture above, FreeGo also sent me some Kracklecorn, a sweet and salty popcorn made by Portlebay Popcorn down here in Devon. My wife and I loved this and devoured a large bag over a couple of sittings, well worth a try. The good news for Gluten Free by the Sea readers is that you can currently get £10 off your first order of £20 from FreeGo using the code “GFBYSEA10′ (exp 31/09). I don’t tend to do full blog reviews of national brands very often, but Nature’s Path is a brand whose cereal I eat almost every day. I’ve recommended it to numerous people over the past couple of years and having recently been sent some samples from their range I thought a review was long overdue. The company was born as far back as 1985 in Canada, and have been selling their free from organic products in the UK for a relatively short period of time. 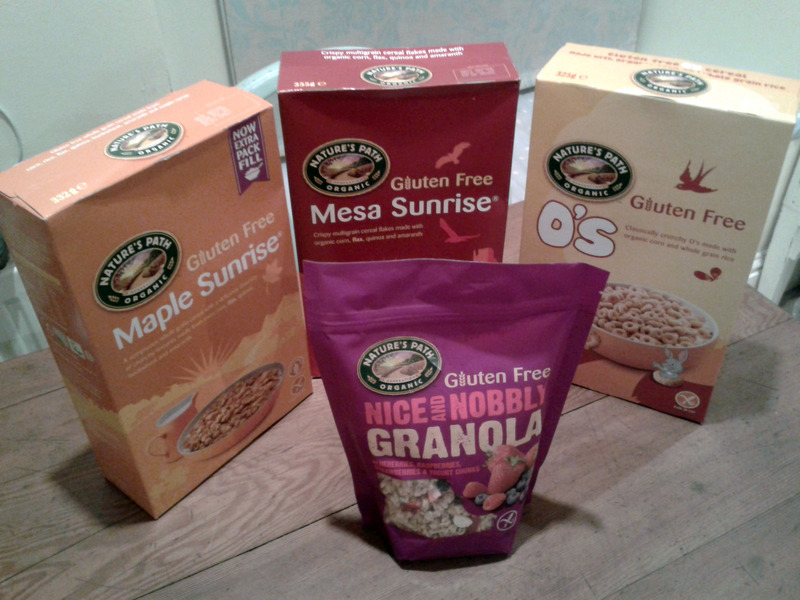 The samples I received were Maple Sunrise, Mesa Sunrise, O’s and a packet of Nice and Nobbly Granola. All of these were of course gluten free, though I do see that Nature’s Path make some products that are not so always check. Let me first start with the Maple Sunrise as I absolutely love this cereal and it is the one I have daily. This cereal is packed with gluten free grains including corn, rice, flax, quinoa, and amaranth which gives it a really great texture. The brand’s Canadian roots come through with the delicious maple flavour that really makes this the perfect cereal for me. Some will no doubt find this one too sweet and I must admit I do usually mix it 50/50 with Dove’s Farm fibre flakes which is a great combination in my opinion. The next cereal I tried were the gluten free O’s. These of course look like the Cheerios that we all remember from our pre-coeliac gluten eating days. Made from corn and wholegrain rice, again these had great texture and a nice crunch. The O’s were a lot less sweet than the Maple Sunrise, and I did miss the sweetness a little at first but after eating them for a couple days I’d soon forgotten this and started enjoying them a lot more. Probably my least favourite of the four was the Mesa Sunrise. These are made from corn, rice, aramanth and quinoa and I just found them a little bland compared to everything else that I’d tried. However, they did work really well when mixed with the Maple Sunrise. I think it seems to be a feature of these cereals that you can really mix them together to create the perfect cereal for you! 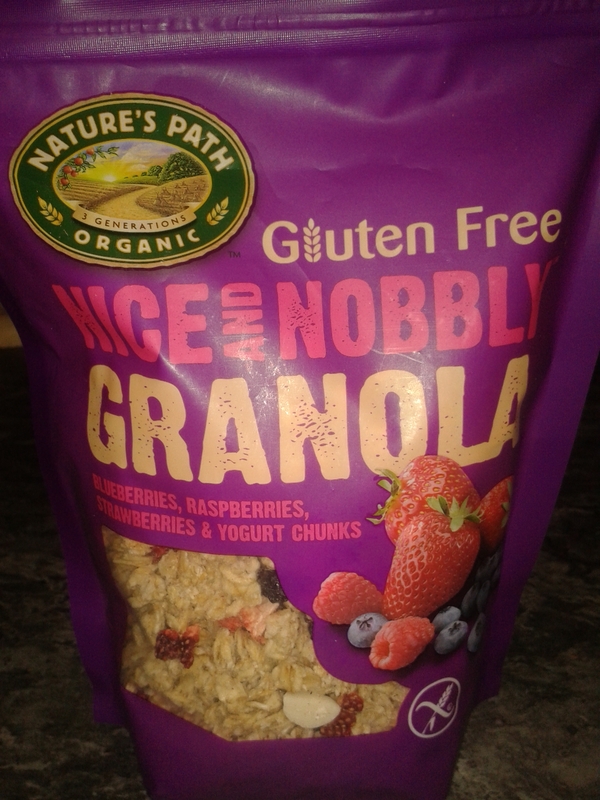 Finally I tried the strawberry, blueberry and raspberry Nice and Nobbly Granola. This also contained yoghurt chunks and is predominately oat based so is not suitable for those with dairy and oat issues. I absolutely loved this stuff, it was so good!! The texture and flavour of the gluten free oats was perfectly complimented by all the fruit and yoghurt chunks. I’ve yet to find this one in Plymouth but when I do I will definitely be stocking up. Again, some people may find this a bit sweet for their palette and may want to mix in some Mesa Sunrise to take the edge off. 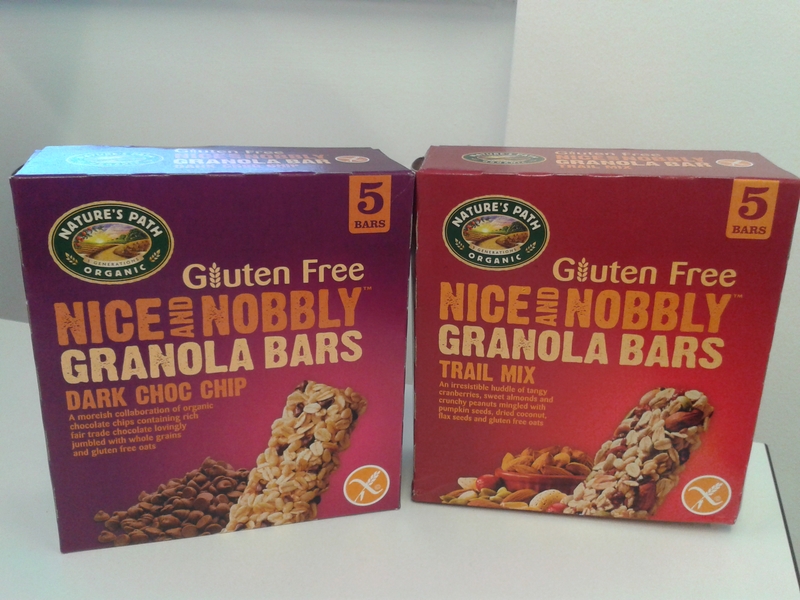 I was subsequently sent some Nice and Nobbly Granola bars to sample, which again contain oats. These were a big hit with both myself and my wife and we were really impressed. They reminded me of the Tracker bars I used to eat when I was younger, nice and chewy. The bars were just the right level of sweet and come in two varieties; Dark Choc Chip and Trail Mix. Naturally I headed straight for the choc chip ones first and they are delicious. What surprised me was that I actually liked the Trail Mix bars just as much, if not more. The Trail Mix is packed full of seeds but there is a lovely cranberry flavour which I really enjoyed. These make the perfect on the go snack to put in your wife’s handbag (sits back and waits for the inevitable smack from said wife!). Are you a fan of the Nature’s Path products? Please comment below and let me know what you think. A couple of weeks ago a big wave of gluten free on the go options were announced. Tesco have launched a range of four pre-prepared sandwiches, Costa Coffee have launched a gluten free chicken wrap and Starbucks veggie wrap is now available nationwide. 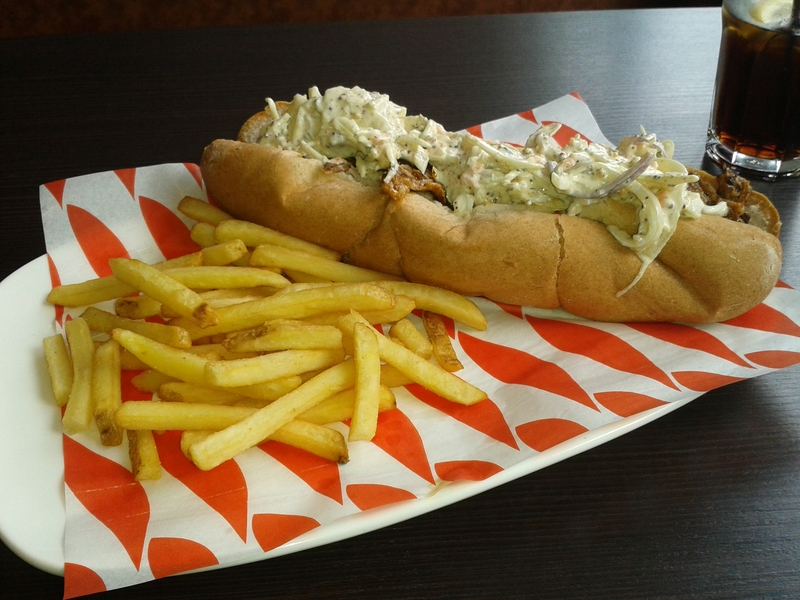 In addition to this Amy’s Kitchen tomato soup and mac & cheese is now available in ASDA cafes, M&S have started selling gluten free scotch eggs and for those in Plymouth JD’s Grill have started offering an amazing gluten free ‘hoagie’ to take away at lunchtimes (pictured right). Life is certainly looking up for coeliacs and those following a gluten free diet with these convenient choices. 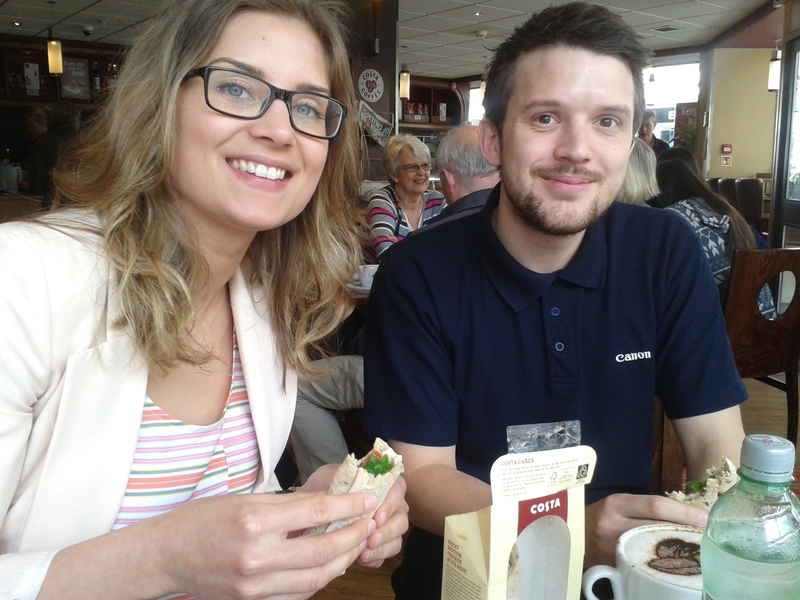 I was subsequently contacted by Costa Coffee and offered the chance to take some friends out to sample their first gluten free savoury offering. Costa have previously offered gluten free brownies and also cherry bakewells, and I believe there were GF Christmas cake slices stocked over the festive period. 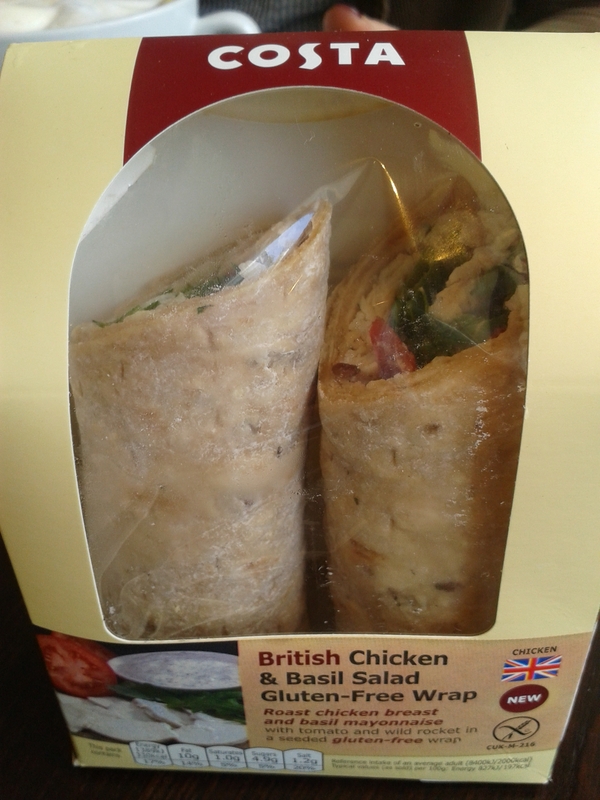 The new wrap consists of British chicken with basil mayo, tomatoes & rocket on a seeded Newburne Bakehouse wrap. Taste testers Sarah and Greg! In my opinion great comments from Sarah and Greg and I’d completely agree with their verdicts. I’m already a fan of the Newburn Bakehouse wraps and the amount of filling was great, plenty of chicken and just the right amount of salad. It was a touch on the dry side and would definitely have benefited from a bit more mayo, though the idea above of sweet chilli sauce would be brilliant! The wrap is priced at £3.75 which isn’t cheap but for a safe, convenient and tasty gluten free option on the go this could be worse. I can’t see me buying this very often in Plymouth when I’ve got Clare’s Gluten Free and JD’s Grill nearby, but I will definitely be buying this again when I’m on my travels. It’s taken a long time for Costa to bring out a savoury gluten free option, but I think this is a good one. One thing I must say is that my wife, Abby, joined us and she is going gluten free this week for Coeliac Awareness Week, but as she is vegetarian there was no savoury gluten free things that she could eat. Hopefully something will be added in this respect in the future. Finally a big thanks to Sarah and Greg for helping out with this review and to Costa for shouting us all lunch today.